Customizability has always been one of Linux's best defining features, and the newly released Ubuntu Linux 12.04 “Precise Pangolin” is no exception. I've already written about a few different ways to tweak Ubuntu's Unity desktop generally, and last week one of those tools--Ubuntu Tweak--was updated to support the latest iteration of Canonical's popular Linux distribution. Now available as a free download, Ubuntu Tweak 0.7.0--also known as “Precise Tweak”--is a brand-new version designed to help you make Ubuntu 12.04 your own. If you've been playing around with the new Ubuntu and wish some things were different about it, this new open source tool can help you make it what you want. It was Ubuntu Tweak 0.6.0 that I covered back in January, and since then a number of additions have been made to the software, including a more polished user interface and even more ways to tweak Ubuntu. Using Precise Tweak, you can disable Ubuntu's new Head-Up Display (HUD) interface, for example, or customize the Unity Launcher. There's also a “Reset” button to revert back to the default settings in case you change your mind along the way. 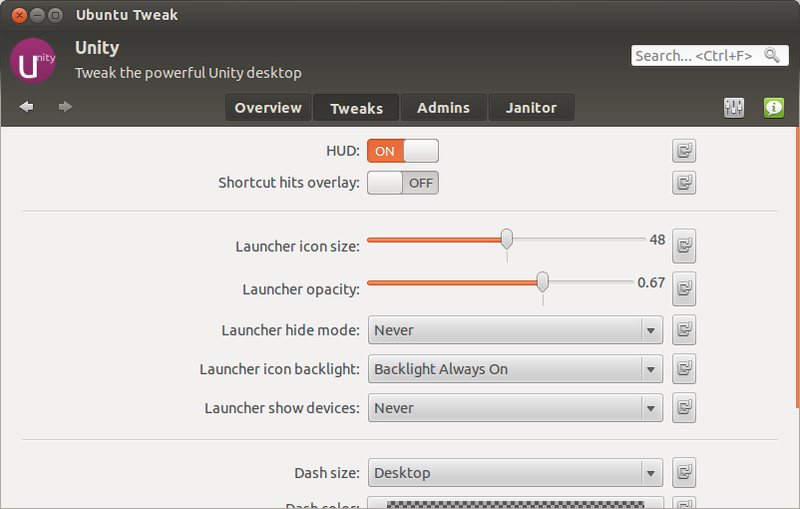 The newly updated Ubuntu Tweak lets you modify key aspects of Ubuntu 12.04's Unity desktop (Click image to enlarge). Perhaps most notable on the interface side is a new search function that's designed to make it easier than ever to zero in on the tools you need for the aspects of Ubuntu you want to modify. Simply type in the keyword you have in mind--“HUD,” “theme,” or “font,” for example--and Ubuntu Tweak returns matching results; from there, you simply press “tab” to navigate to and launch the relevant feature. Four features that were removed from the previous version have now been restored to Ubuntu Tweak 0.7.0: Application Center, Source Center, Templates, and Scripts. A raft of smaller improvements have been added as well, as a quick glance at the software's release notes makes clear. Many more screenshots are posted in the software's official announcement. Please post your impressions in the comments if you decide to give this nifty tool a try.